Watching my garden and taking photographs in it has made me more aware of how it looks with differing degrees of light levels during the day. It is amazing how quickly these levels change and how the essence of vibrant colours lit by evening sun just dissolves in a second. Last night I was trying to capture some photos of the siskin juveniles that are visiting my garden at the moment but instead was drawn to photograph the siskin male that you can see below. 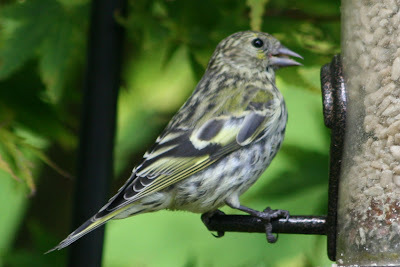 Juvenile siskins I have found quite tricky to get good clear shots of with both my camera and video camera. However I heard today, when I was out trying again, a bird call that caught my attention! I have to be honest here and say that I do not recognise all my visiting birds by their calls – although I’m sure in time I probably will. I listened and watched the feeders and trees. A few birds dropped to the feeders. I then heard the bird call again and it sounded much closer. I then looked closer! 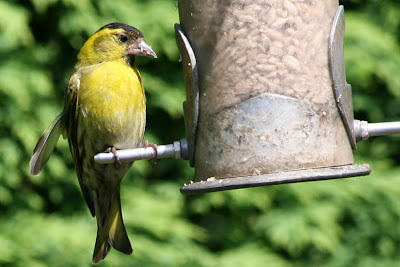 The call was coming from a male siskin at a feeder with sunflower hearts and in a moment a young siskin joined him at another bar of the feeder! 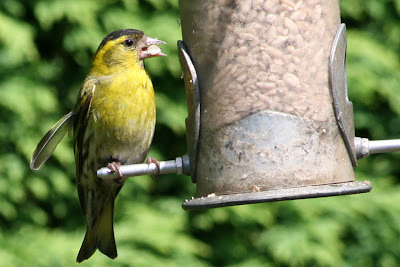 What was good about this was that I am now sure that I have siskin young visiting my garden as until this I was uncertain. I have to say though that I haven’t noticed any females visiting at the moment. 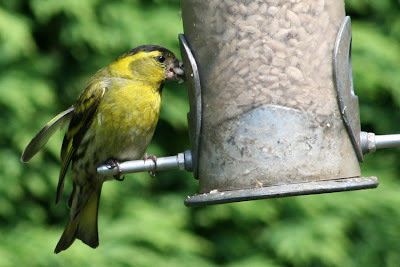 The photograph below shows a siskin juvenile visiting my garden yesterday but I hope to get clearer pictures with the male soon. All photos shown above were taken in my garden on 24th July 2007.